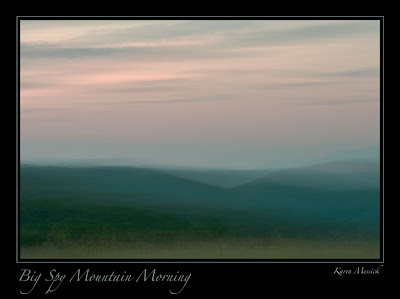 As photographer's we should always get up early when we are out shooting, just to see the dawn and what it will bring. So on the last weekend in the Blue Ridge Mountains on Saturday morning, we were out by 5:00 and went back up to Big Spy Mountain overlook, where we had decided the day before would make for a good sunrise and maybe some dewy subjects. Upon waking the temperature was 72 degrees. The night had not cooled enough to even make the grass wet and the wind was blowing very hard from the West, so my visions of dewy butterflies on clover quickly vanished. Not having Internet access, cell phone connection or TV we did not know what what the weather forecast was to be. When we arrived there were already some photographers from our group who had climbed to the grassy high point in order to get the best elevation for sunrise. I could see their faint silhouettes against the predawn sky. 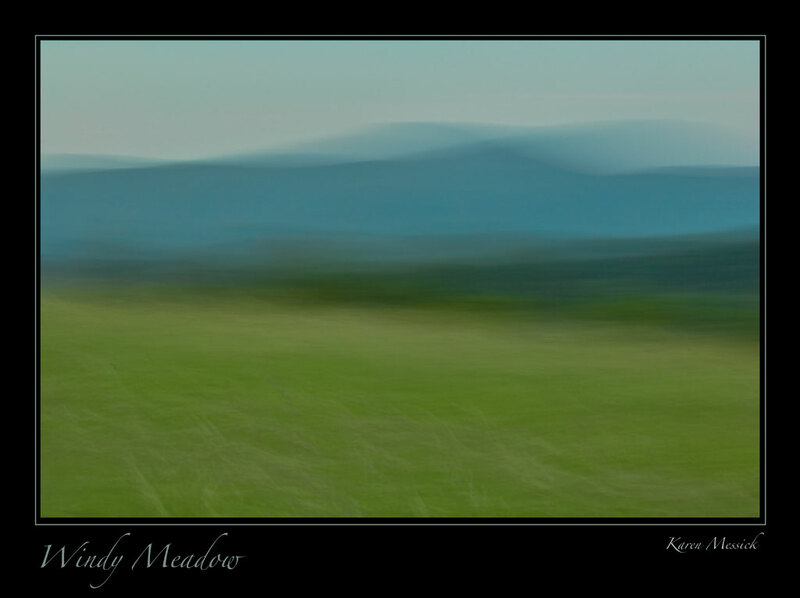 I hiked up through the grasses as well. The sunrise was not spectacular but it was a pretty pastel pink, with very few clouds; with the blue mountains and the green grasses as companions to sunrise, I went into swipe mode....just a wash of colors and shapes. 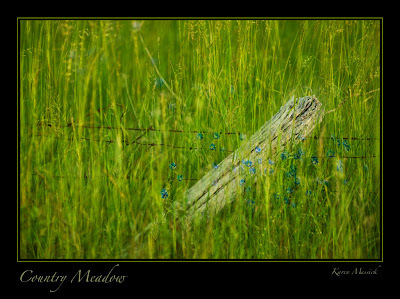 After the sun came up I walked through the meadow a little and made some images of meadow flowers and barbed fence. 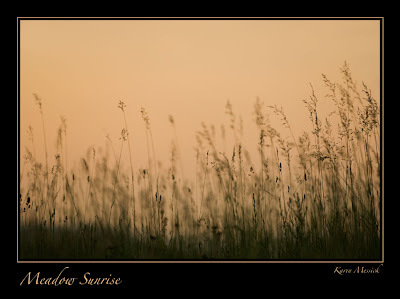 I knew those images were not strong enough to stand on their own, but the light was soft and the scene serene and I was there to shoot the morning scene. 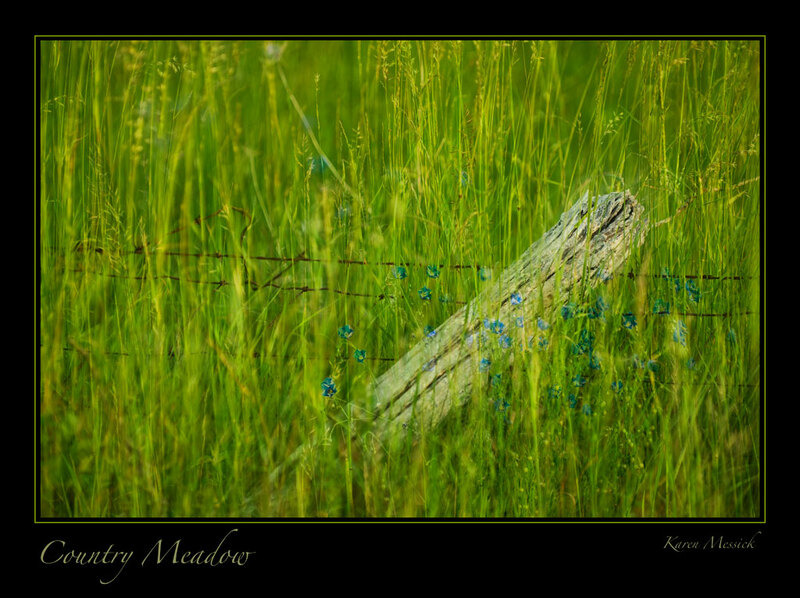 The fence image is a layer blend of meadow flowers and fence line. The opening image is two images created in a burst of shots in swipe mode then processed into a side by side on black canvas to make the single image. After shooting a little more there, we headed to Crabtree Falls for a quick look...before heading back for breakfast at 8:30 and the rest of the day's shooting ramble........which is another blog!